Bolz Construction and Excavating, LLC of Paradise Michigan is your Eastern Upper Peninsula Contractor. With 20 years of construction experience, Jim and his team are ready to help you reach your property goals, build your dream home, or add some new interior life to your existing home. We thank you for visiting our website and look forward to hearing from you. 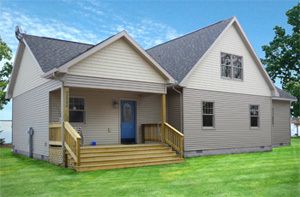 Eastern Upper Michigan Contractor with 20 years of construction and excavating experience. Quality construction that will bring generations of enjoyment! Bolz Construction and Excavating was established in Paradise in 1988. Jim Bolz has been in the construction and excavating business for 20 years, a Licensed Builder for 17 years and a Licensed Septic Installer for Chippewa, Luce, Mackinac Counties. He has also been in the Snow Removal business for 18 years. Bolz Construction and Excavating, LLC of Paradise Michigan provides New Construction, Remodeling, Pole Barns, Decks, Site Work, Septic Installation, Snow Removal to the following areas: Paradise, Whitefish Point, Pike Lake, Two Heart Area, Newberry, Eckerman, Trout Lake, Brimley and the surrounding areas. Bolz Construction and Excavating, LLC provides clients quality construction services to the entire Eastern Upper Michigan. 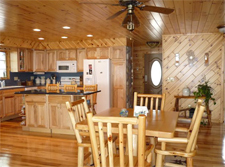 Whether you are looking to build a new home, a cabin, or you may want to take your older home & give it a "new look", consider Jim and his team for your needs. »Click here to learn more. Bolz Construction and Excavating, LLC can provide your business with a great start - an impressive building inside and out. Remember that first impressions can spell success. Need a new place for storage or a workshop? 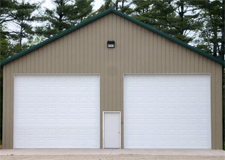 Big or small, Jim can build a pole barn for all your storage needs. With our Excavating Services, we can take an undeveloped lot and turn it into a beautiful building site. We also provide Septic Services. Commercial, Residential, or the winter weekend get-a-way, call Jim for your Eastern Upper Michigan Snow Removal needs. "Jim is one of the most honest and sincere business persons that we have ever run across. There was no rushing or cutting corners in any phase of the project. Quality always came first. My wife and I are looking forward to many happy years of retirement knowing that our dream house was built with pride and unsurpassed quality." Please Visit our Construction Services Page to read the entire endorsement.